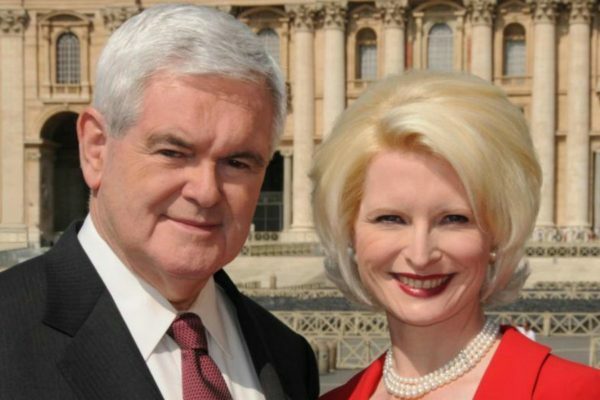 WASHINGTON – Callista Gingrich, wife of former House Speaker Newt Gingrich, will be Donald Trump’s nominee for U.S. ambassador to the Holy See, two U.S. news outlets are reporting. The New York Times and CNN reported May 14 that the official announcement of the nomination is waiting to be approved by the Office of Government Ethics. White House Press Secretary Sean Spicer in a May 15 news briefing wouldn’t confirm Gingrich’s nomination and said “nothing’s official until it’s announced,” when asked about the matter. “The answer is we have no personnel announcements,” Spicer said during the briefing. Callista Gingrich, 51, a former congressional aide, is the president of Gingrich Productions, which produces documentaries as well as other materials related to her husband, Republican Newt Gingrich, who served from 1995 until 1999 as the 50th Speaker of the U.S. House of Representatives. In 2010, the company released the film “Nine Days That Changed the World” about Pope John Paul II’s nine-day pilgrimage to Poland in 1979 and how it played a part in the fall of communism in Europe. Callista Gingrich graduated from Luther College in Decorah, Iowa, in 1988, majoring in music, a passion that has remained with her throughout life. She is a longtime member of the choir at the Basilica of the National Shrine of the Immaculate Conception in Washington. Some like John Schlageter, executive director of the Bethlehem University Foundation in Washington, hailed the choice. “It might make me biased, but I think that her years of singing in the choir at the national shrine has given her a backstage pass to some of the most important events in the life in the church in the United States, including two papal visits,” said Schlageter, who is a friend of the couple. The Gingriches are patrons of Bethlehem University, the first Catholic university in the Holy Land founded by the Vatican and the De La Salle Christian Brothers, he said. Schlageter said Callista Gingrich’s time producing the documentary about Pope John Paul helped her create professional relationships and friendships in the U.S. and Rome that will serve her well should she be confirmed to the post. Others criticized the choice online because she admitted to having an affair for years with Newt Gingrich while he was married to his second wife. After his 1999 divorce, the two married the following year and he became a Catholic in 2009, saying Callista, a lifelong Catholic, was instrumental in making that choice. If confirmed, she will succeed Ken Hackett, former head of Baltimore-based Catholic Relief Services, who served as the 10th ambassador to the Holy See under President Barack Obama. He held the post from October 2013 until mid-January.